“OM” (pronounced A-U-M) is a familiar mantra in the yogic community. 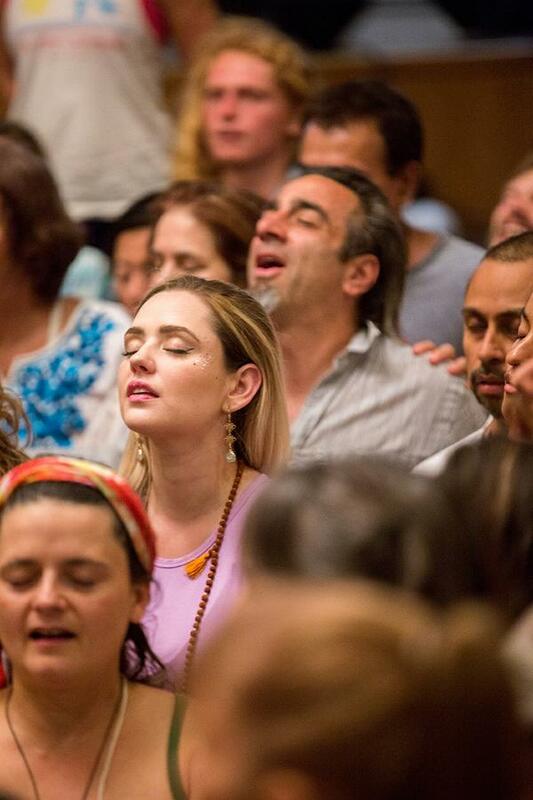 It is often how we end yoga, meditation, pranayama, and kirtan gatherings. And, as many other commonly accepted yogic practices, it has its own story. The Khândogya-upanishad (chapter of the Sama-Veda) begins with recommending meditation on the syllable Om, a sacred syllable that had to be pronounced at the beginning of each Veda and of every recitation of Vedic hymns. The practice of yoga (most commonly seen as in the form of physical asana here in the west), along with the religions of Hinduism, Jainism and Buddhism, comes from the Vedas, which are a large body of religious texts originating in the ancient India. The “Vedas” translates to “knowledge” or “wisdom”, and are considered by Hindus to be apauruṣeya, which means “not of a man, superhuman” and “impersonal, authorless”. There are four Vedas: the Rigveda, the Yajurveda, the Samaveda and the Atharvaveda. The Samhitas (part of the Samaveda) date to roughly 1700–1100 BCE, and the texts constitute the oldest layer of Sanskrit literature. As connected with the Sâma-veda, that syllable Om is called udgîtha. Its more usual name is pranava. The object of this Upanishad is to explain the various meanings which the syllable Om may assume in the mind of a devotee, some of them being extremely artificial and senseless, till at last the highest meaning of Om is reached: Brahman, the intelligent cause of the universe. 2. LET a man meditate on the syllable Om, called the udgîtha; for the udgîtha (here referring to a portion of the Sâma-veda) is sung, beginning with Om. 2. The essence of all beings is the earth, the essence of the earth is water, the essence of water the plants, the essence of plants man, the essence of man speech, the essence of speech the Rig-veda, the essence of the Rig-veda the Sâma-veda, the essence of the Sâma-veda the udgîtha (which is Om). 3. That udgîtha (Om) is the best of all essences, the highest, deserving the highest place, the eighth. Essence, or rasa, is explained in different ways, as origin, support, end, cause, and effect. Rasa means originally the sap of trees. That sap may be conceived either as the essence extracted from the tree, or as what gives vigor and life to a tree. In the former case it might be transferred to the conception of effect, in the latter to that of cause. In this sentence it has sometimes the one, sometimes the other meaning. Earth is the support of all beings, water pervades the earth, plants arise from water, man lives by plants, speech is the best part of man, the Rig-veda the best part of speech, the Sâma-veda the best extract from the Rik, udgîtha, or the syllable Om, the crown of the Sâma-veda. 4. What then is the Rik? What is the Sâman? What is the udgîtha? ‘This is the question. 5. The Rik indeed is speech, Sâman is breath, the udgîtha is the syllable Om. Now speech and breath, or Rik and Sâman, form one couple. 6. And that couple is joined together in the syllable Om. When two people come together, they fulfil each other’s desire. 7. Thus he who knowing this, meditates on the syllable (Om), the udgîtha, becomes indeed a fulfiller of desires. 8. That syllable is a syllable of permission, for whenever we permit anything, we say Om, yes. Now permission is gratification. He who knowing this meditates on the syllable (Om), the udgîtha, becomes indeed a gratifier of desires. 9. By that syllable does the threefold knowledge (the sacrifice, more particularly the Soma-sacrifice, as founded on the three Vedas) proceed. When the Adhvaryu priest gives an order, he says Om. When the Hotri priest recites, he says Om. When the Udgâtri priest sings, he says Om, all for the glory of that syllable. The threefold knowledge (the sacrifice) proceeds by the greatness of that syllable (the vital breaths), and by its essence (the oblations). These are allusions to sacrificial technicalities, all intended to show the importance of the syllable Om, partly as a mere word, used at the sacrifices, partly as the mysterious name of the Highest Self. The “Soma Sacrifice” referenced meant the offering of a medicinal plant tea or food first offered to the earth & the priests’ god before being ingested by the practitioner. This offering showed respect to the forces of nature much greater than human him/her self, and were usually accompanied by tapas or daylong/yearlong silent vigil and meditation as a sign of passing from the realm of the profane to that of the sacred. As every priest at the Soma-sacrifices, in which three classes of priests are always engaged, has to begin his part of the ceremonial with Om, therefore the whole sacrifice is said to be dependent on the syllable Om, and to be for the glory of that syllable, as an emblem of the Highest Self, a knowledge of whom is the indirect result of all sacrifices. The greatness of the syllable Om is explained by the vital breaths of the priest, the sacrificer, and his wife; its essence by rice, corn, which constitute the oblations. Why breath and food are due to the syllable Om is explained by the sacrifice, which is dependent on that syllable, ascending to the sun, the sun sending rain, rain producing food, and food producing breath and life. He who simply pronounces the syllable Om as part of his recitation at a sacrifice, and he who knows the hidden meaning of that syllable, both may perform the same sacrifice. But that performed by the latter is more powerful, because knowledge is better than ignorance. This is, as usual, explained by some comparisons. It is true that both he who knows the quality of the harîtakî (Ayurvedic purgative medicinal plant) and he who does not, are purged alike if they take it. But on the other hand, if a jeweler and a mere clod sell a precious stone, the knowledge of the former bears better fruit than the ignorance of the latter. This blog is a compilation of many resources & teachings, however the main text & translations are derived from The Upanishads, Part I (Sacred Books of the East) by Max Muller.